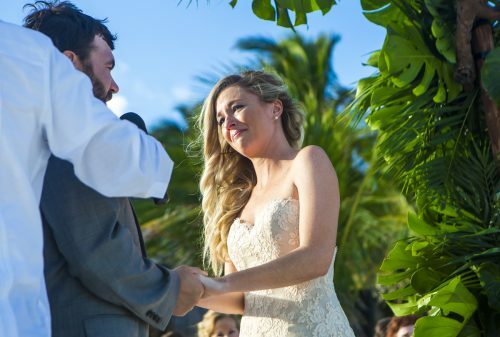 Jessica and Brian are Fun In The Sun Weddings’ newest newlyweds! This tale of love begins with an insanely clean bathroom, and a Superbowl party. In that order. Before Jessica and Brian met, she spent many a Sunday watching football at his condo with his roommate and friends while he was at work. For Jessica, it was love at first sight of the immaculate bathroom Brian kept. She made the first move and texted him about it. Two weeks later, they met face-to-face at Brian’s Superbowl party, when Jessica came crashing out of the condo onto the slick frozen ground outside and ended up upside down. A graceful introduction. Ahhhh, who says chivalry is dead? 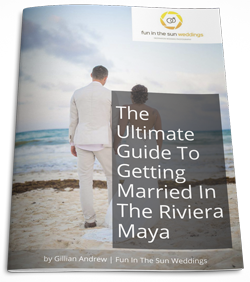 Their decision to get married on the beach in Tulum began while on a vacation in the Riviera Maya. On a lazy beach stroll one afternoon they stumbled across the Ak’iin Beach Club and settled in for lunch with the place all to themselves. Jessica absolutely fell in love with the place. After they got engaged, she saw a wedding published on Style Me Pretty at The Ak’iin and knew she had to be married there. 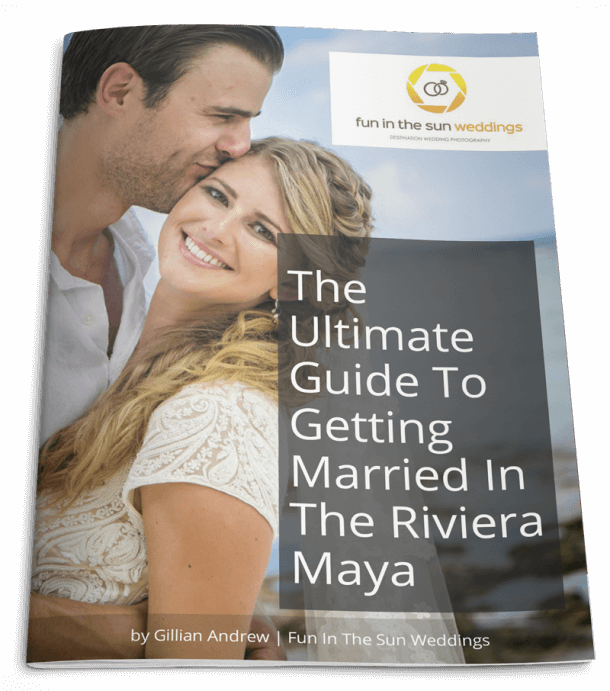 So she hunted down the incomparable Kristee Smith, wedding planner of Fresa Weddings, and it all fell into place. 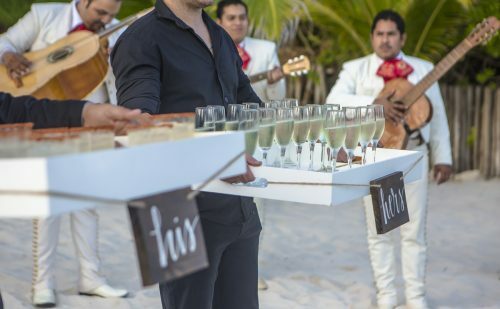 Fresa Weddings brought to life Jessica’s vision of a romantic, God-honoring ceremony, a fiesta inspired cocktail party with a mariachi band, an intimate dinner, and finally a crazy party to follow. 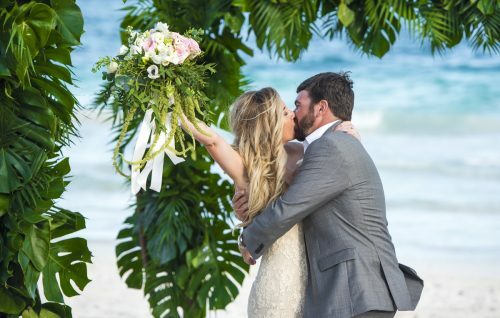 Her beach wedding was exactly as she wanted it, flowing from gorgeous romance to wild celebration. Jessica was a stunner thanks to hair and makeup magicians Beso Brides. 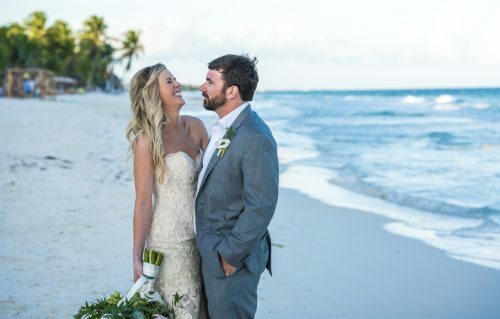 Her beach wedding dress from designer Maggie Louise, was not what Jessica had originally envisioned, and she was hesitant to even try it on, but when she did her mother and sister cried. Jessica’s only self-proclaimed Bridezilla moment was in regards to her table centerpieces. She ordered them online, and she had to have them. But when they arrived, they came in 17 very large boxes! How were they supposed to get these down to Mexico, everyone asked? Well thankfully, they have devoted friends and family who divvied up the goods and trekked them south for her celebration. 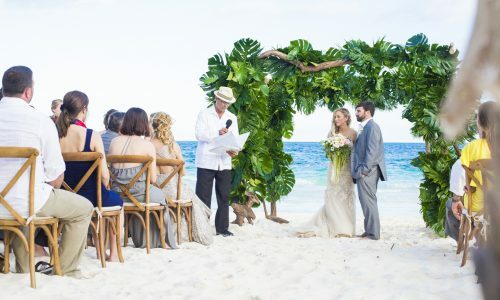 The tropical jungle floral design by non-other than Vanessa Jaimes was complemented by the bride’s tapped crafty side with all of the place cards, his & hers signs, and the Mr. & Mrs. signs. I knew at that moment that I had made the best decision of my life. It was just me and him making a commitment for life to love and honor each other. Jessica and Brian, we wish you nothing but wonderful things (and many babies!) as you start this next chapter of your lives together. It has been a true pleasure sharing this amazing time with you! Congratulations! 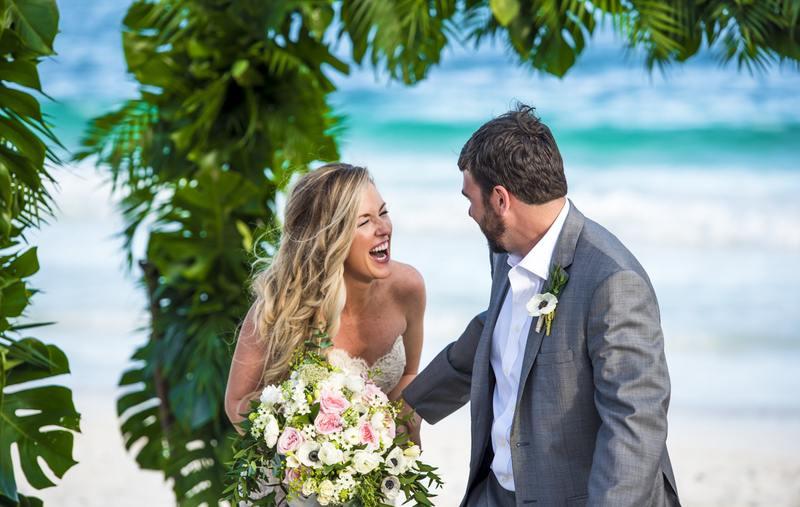 And if you are looking for the best Tulum wedding photographers then contact us today! 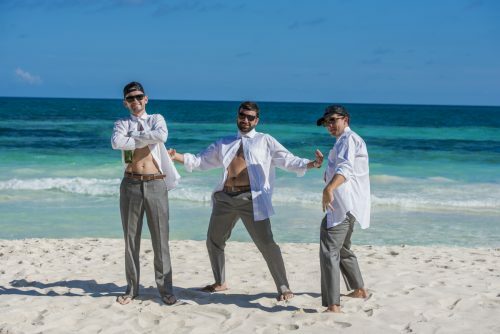 We are Fun In The Sun Weddings, the best wedding photographers in Tulum, Mexico. Want to know more about Ak’iin Beach Club? 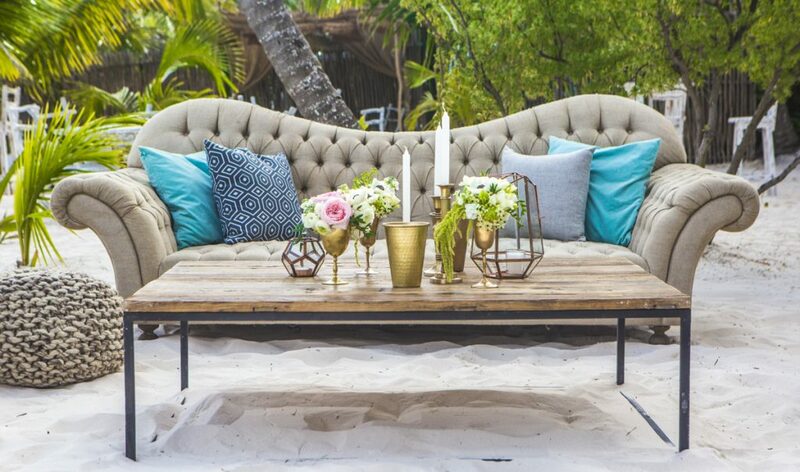 Here is why you should consider an Ak’iin Beach Club wedding. And read unbiased reviews on Tripadvisor here. Without a doubt in my mind, we had the BEST photographer out there! Marc made it so fun and easy! I know he has some AWESOME action shots of us all dancing the night away and I cannot thank him enough for his patience with our wild group.